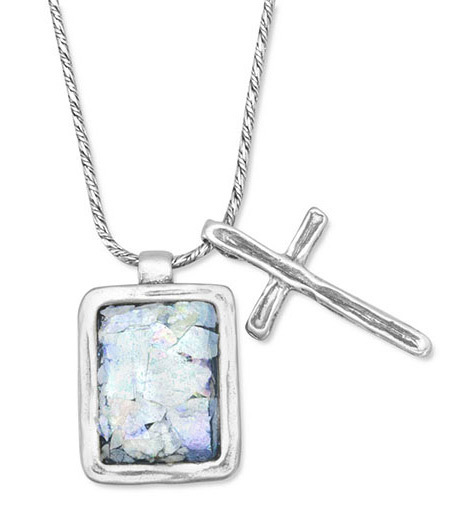 One of our most unique Christian jewelry pieces, a genuine Roman glass pendant hangs on this 18" necklace with a dangling cross. Rectangular Roman glass pendant measures 24mm x 16.5mm in size (just under 1" x 0.65") and cross measures 26mm x 14.5mm (1" x 1/2"). Necklace is 18 inches in length. Roman glass is authentic ancient glass discovered in archaelogical exvacation sites in Israel or the Mediterranean. The pieces of glasses likely originally belonged to a vase, jug, or other vessel. Purchase this original artifact from history from Apples of Gold Jewelry, a Christian-owned company. We guarantee our Roman Glass Pendant with Cross Necklace, Sterling Silver to be high quality, authentic jewelry, as described above.